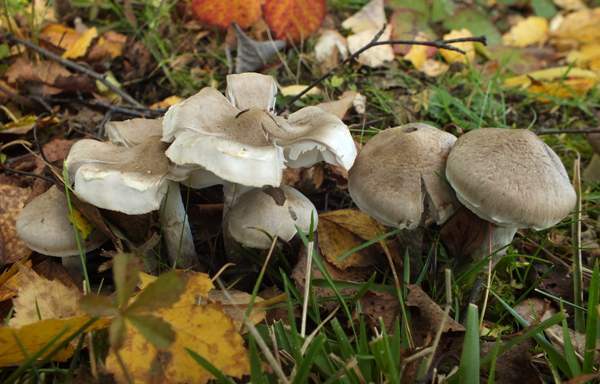 Although many greyish-brown Tricholoma fungi are difficult to identify from macroscopic characters alone, the Girdled Knight is not one of these. 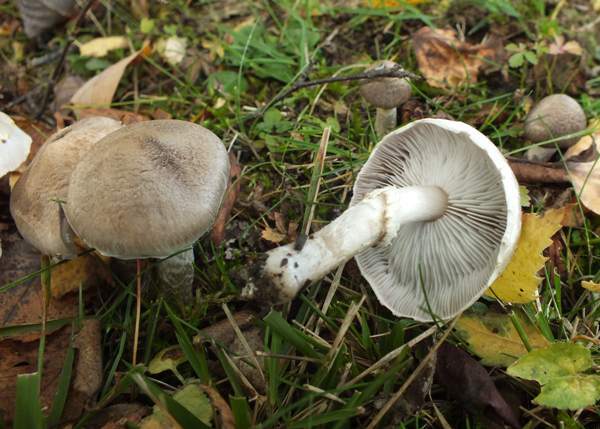 A finely scaly grey-brown cap plus a distinct ring on the stem are key features. Microscopically, it is unusual in having narrow oval spores, whereas most fungi in this genus have broader oval spores. This mycorrhizal mushroom is found with various kinds of willows, including Dwarf Willow in the slacks on some sand-dune systems. In Britain and Ireland this is one of the less common of the 'knights', but it has been recorded in a number of locations in Scotland, Ireland, Wales and England, often in quite large groups. The Girdled Knight is quite common in Scandinavia, and it has been found also in Germany, France, Spain, Portugal, Italy and many other countries on mainland Europe. 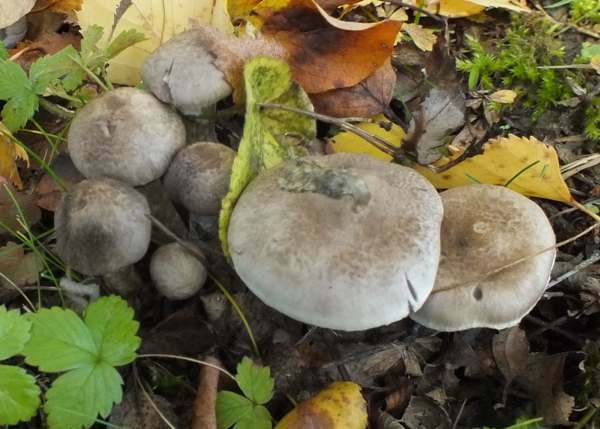 The currently-accepted scientific name Tricholoma cingulatum dates from an 1890 publication, wherein E. Jacobashch (about whom I have no biographical information other than publication dates... can you help?) transferred this species to its present genus. 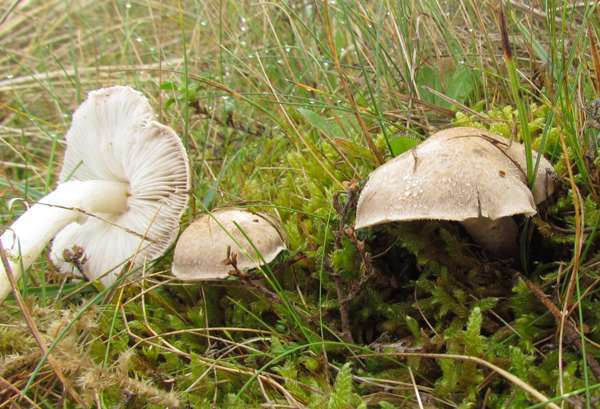 Synonyms of Tricholoma cingulatum include Tricholoma ramentaceum, Armillaria cingulata (Almfelt) Quél. and Agaricus cingulatus Almfelt ex Fr. 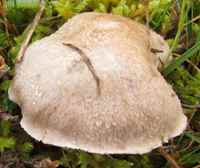 The generic name Tricholoma means 'with hairs on the edge', which refers to the rim of the mushroom and is true of only a tiny minority of species (the knights) in the Tricholoma genus. The specific epithet cingulatum means 'with a girdle, belt or collar'. Convex at first, expanding with a slight umbo; pale grey or grey-brown, covered in fine grey-brown felty scales; initially roundish but often becoming irregular with a slightly wavy margin when mature; 3.5 to 6cm across. Whitish with a woolly or cottony ring; cylindrical; 5 to 8cm long, 8 to 12mm diameter. Ellipsoidal, smooth, 5-6 x 2.5-3.5µm; inamyloid. Taste and smell slightly mealy. Mycorrhizal, nearly always found with willows; sometimes in dune slacks with Dwarf Willow. June to October in Britain and Ireland. Tricholoma sciodes is similar but does not have a stem ring. Tricholoma cingulatum is recorded as edible in many field guides, but care is necessary to avoid confusion with any of the slightly poisonous greyish Tricholoma species that can cause stomach upsets. It is easy for beginners to confuse this species with deadly poisonous pallid mushrooms such as Amanita virosa, and so we cannot recommend the Girdled Knight as a culinary collectible for anyone but the most experienced and capable of fungi foragers. Fascinated by Fungi, Pat O'Reilly 2016. 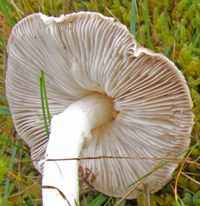 Taxonomic history and synonym information on these pages is drawn from many sources but in particular from the British Mycological Society's GB Checklist of Fungi and (for basidiomycetes) on Kew's Checklist of the British & Irish Basidiomycota.